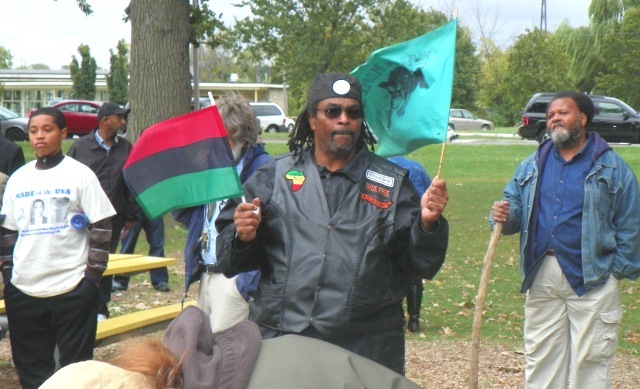 Rally to save Belle isle Sept. 22, 2012: BLACK POWER!! 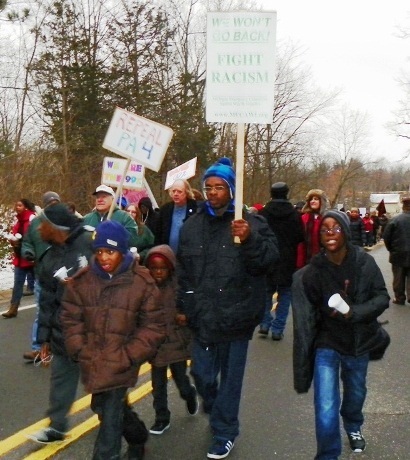 Marchers on Snyder’s house demand a fight against racism, Jan. 16, 2012. When protestors from the Occupy for Democracy group rallied outside of Governor Rick Snyder’s Ann Arbor home on Martin Luther King Day, they called attention to an alarming fact. If the governor appoints an Emergency Manager for Detroit, he will give someone the power to fire city officials, sell city assets, and break city contracts. By this act the governor would, in essence, strip numerous Black elected officials of their authority to govern and their power to protect the natural resources and trust of the city. Such an outcome would be damaging to the democratic principle of equal access to representation that citizens of this nation have fought so hard for. Detroit’s most precious jewel, Belle Isle. And there is another, more subtle threat to the democratic ethos of the city that could materialize if Detroit’s officials were to be thus disempowered: the seizure of common land. 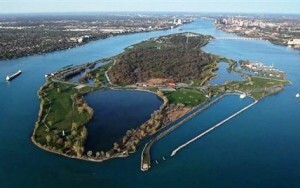 Every newspaper account that I have read on Detroit’s fiscal crisis notes that if an emergency manager were to be assigned, a potential outcome would be the sale of Belle Isle, that splendid stretch of floating land between the U.S. and Canada kept by the city for the common good. A dazzling 982-acre island park overlooking the Detroit River, Belle Isle is unique among the many famous urban parks developed by major cities like New York, Chicago, and Cincinnati in the late 1800s. It is the largest municipal island park in the country, and it harbors views across international borders. Within its abundant grounds, Belle Isle shelters 230 acres of old growth forest with a variety of 200-year-old tree specimens. The island is also a fresh water conservancy due to its river home and ample lakes. Michigan Ojibwe tribe members gathering ingredients for maple syrup in the 1700’s. Both they and French settlers, who traded with them, considered Belle Isle common land. When the city purchased the island from private hands in 1879, a major appeal of the location was the abundance of fresh water, which could be sheltered from industrial manufacturers and protected for future public use. This sense of preserving Belle Isle for the public good stretches back, in fact, to its earliest recorded history. 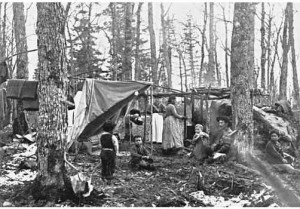 In the 1700s, Ojibwe groups shared access to the island, which they called White Swan (Waabizi or Wanabizi in the Anishinaabe language) with French settlers. In the French colonial period, Hog Island (Isle aux Cochons), as Belle Isle was then known, was used as a public commons where settlers loosed their livestock, mainly hogs, to roam freely. Family re-union picnic on Belle Isle July, 2012. After Belle Isle became a city park and gained its current name, residents and tourists enjoyed the island as a recreational destination. 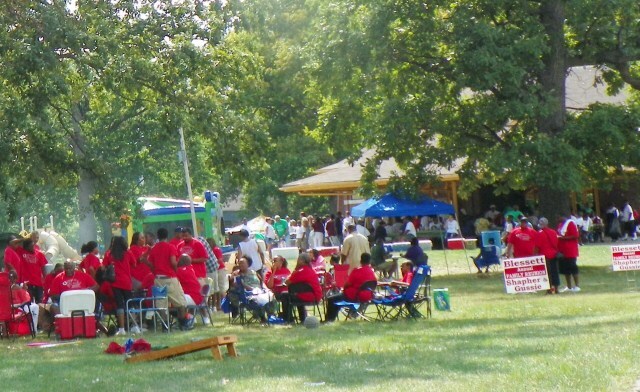 In the 1940s and 1950s, Black east-siders made Belle Isle their own by gathering at the park for socials and church picnics. 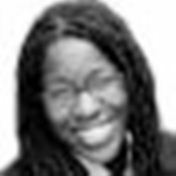 Mistinguette Smith, founder of the Black/Land Project, who recently visited Detroit to interview Black women about their views of land, found that Belle Isle was a focal point of these women’s stories. For Black women in the city, memories of good times on Belle Isle — walking along the river’s edge with friends, wearing shorts and holding ice cream cones — capture a period of contentment rich with the joys of community. This feeling of pleasure, pride, and connection with the crown jewel of the city’s parks is something that Detroiters cannot afford to lose. Black children enjoying Belle Isle in 1955. 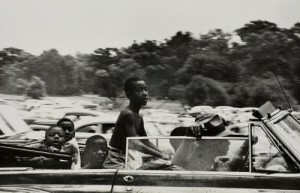 Photo by Robert Frank. If Detroit is a black city, then Belle Isle is black land. It is precious, peaceful, protected land held in trust for the people of the city. Land is the basis for human livelihood and prosperity. And yet, across this nation and for centuries, African Americans have had valuable land stripped out from under us– think of those 40 acres that never materialized after the Civil War, of the many black families who lost farms to illegal deals and swindles after Reconstruction, of the Geechee and Gullah communities on the sea islands of Georgia and South Carolina who lost their land to resort development, and of the struggling residents of Detroit who are losing their own backyards to foreclosure. 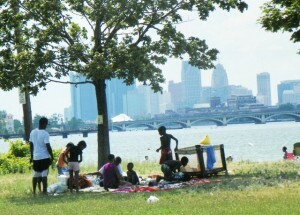 Family picnics near Belle Isle beach with view of downtown Detroit July, 2012. The loss of Belle Isle to private purchasers, beholden only to themselves, would be a sad addition to this lamentable list. After a sale of that magical isle with its majestic trees and shimmering waters — condos, casinos, exclusive clubs and gated communities are unlikely to be too far behind. As a public place owned by the city, a commons enjoyed by all residents and visitors, Belle Isle is priceless. I dare say that Detroit’s properly elected government officials know this. But what about a wildly empowered emergency manager whom Governor Snyder might impose? I cannot be so sure.